You have exported your video losslessley from your editing package. It's been made progressive at some point along the way. Does it still look it's best? If the answer is "yes" then I can unequivocally say that you are wrong. I've yet to meet a source that I can't get to look more appealing - and that's what it's all about isn't it? Even some of the cleanest digital transfers can have problems. Almost every video could do with a little cleaning. Not only that, but what is designed to look good on TV won't always look good on a monitor - we need to tweak. Then finally there is the problem of compression. There are certain filters that although they don't look like they've done much, they have in fact made your video much easier to compress. Sharpening filters - These can improve the visual quality of an image by making the edges more defined, enhancing the details. Smoothing filters - These can hide compression artefacts or compensate for other sources of noise and/or colour errors. Colour adjustment filters - These can correct issues with the overall look of the video - the brightness, the contrast, the saturation etc. Exotic filters - filters designed to overcome a particular video problem such as ghosting, moire, dot crawl etc. Lots of programs have these sorts of filters... but frankly they all pale in comparison to the filtering power of Avisynth and its plugins. The AMVapp includes a LOT of the most popular plugins, and hopefully the most up-to-date versions. All the filtering on this page can be done with the basic AMVapp install and the commands listed here. For the particular guide I am working directly from a DVD source so, if you are interested, you can maybe try and duplicate some of these things yourself if you have the DVD. The disc is the region 1 Utena TV - the first DVD of the Black Rose arc "The Black Rose Blooms" released by Central Park Media. CPM are, in my experience, notorious for poor quality DVD prints. 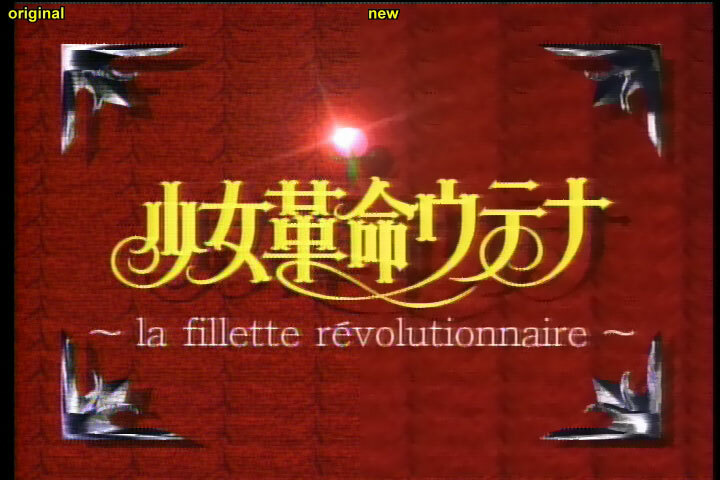 Admittedly the source for Utena isn't particularly pretty anyway but it has been exaggerated by poor analogue transfers and low bitrates. The whole disc is squeezed into 6 Gb - leaving at least another 3 Gb blank... wasting space which could easily be used to make the video footage look better. We have pretty much every visual problem you can think of in this image right here. 1) Macroblocking - if you look at the blue floor you can see lots and lots of macroblocking. This is mostly caused when a frame doesn't have enough bits to encode an area so it has to do more rigorous averaging. This averaging can sometimes round differently from block to block, causing this effect. 2) Mosquito noise - if you look to the top of Utena's head at her hairline you will see that towards the edge you get a peppered effect that we call mosquito noise. In fact most of the edges on the whole image suffer from this problem. 3) Film noise - It is actually film noise that can cause a lot of problems 1 and 2. Film noise you find in blocks of colour and they show up in the form of minor fluctuations - almost like dust. This can actually have an appealing effect sometimes but does make a source harder to compress. 4) Rainbowing - There's not really that much on this image (if you want to see a lot of rainbows, look at Alien 9 - also by Central Park Media) but there are traces of yellow bordering the edges of Utena's sword hand shirt cuff. Not enough to be too annoying but another problem that in a sharper source would be really obvious. 5) Dot crawl - this is really hard to see, especially as it's a "moving" noise effect that changes with frames. However, other scenes with red show a marching ants effect in the red areas, particularly near black borders. 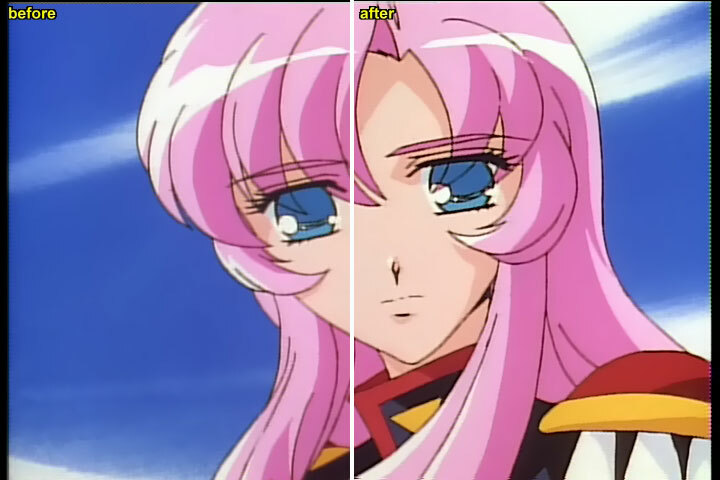 6) Faded colours - CPM are actually much better with the newer volumes of Utena. The first two dvds are more washed out looking than this. However, the colours could do with a little tweaking - as you'll see more clearly later on. 7) Blurry outlines - The image is very very soft, partly due to the transfer and partly due to the old school techniques being used. Even so, it's too soft so to look its best the edges could so with being sharpened. Luckily we can fix all of these things and do much more besides. Load up your avs file into VirtualDubMod and press Ctrl+E to bring up the avs script editor. As described earlier, this will enable you to change the settings on your script and then press F5 to update the image to see the effect. The above frame came out looking like this. Already you can see how the blocking in many areas has been reduced. In fact, because this dvd has so many of these problems, you can go up to cpu=6 and not worry too much about losing details as there aren't any to lose. Before the filtering: Getting the right colourspace. As it is likely that you are working on a lossless encode of your video, it is equally likely that this is in RGB. All the codecs that you could use for compression for the internet will encode YV12 footage. Luckily most the filters used in this guide use YV12 colourspace too. So, you should make sure you have the correct colourspace for your processing. If you deinterlaced, it is likely that you have already done this conversion. If you used a YUY2 or RGB deinterlacer you should add ConvertToYV12() after that deinterlacer command. Getting rid of Macroblocking, Mosquito Noise and Film Noise. If you want to smooth an image, there are basically two ways to approach the idea. The first one is the most obvious - spatial smoothing. Spatial smoothing is where you take one frame at a time and try to smooth out any problems in each individual frame. Temporal smoothing, however, is very different. Temporal smoothing looks at a pixel or group of pixels and compares to the same pixel/group in the frames before and after this one. By doing so, a temporal smoother looks for changes in these pixels. If an image isn't moving but there are very small changes in the pixels then this can be detected as noise and smoothed out. Both of these have a visual impact on your footage but spatial smoothing is often the most visible. Temporal smoothing, however, is type that improves compressibility the most as distribution codecs all only encode the differences in the frames - so by reducing the differences by smoothing across frames you get more encoding bits to spend on the details in the image. Temporal smoothing is always recommended when doing internet distributions. In your encode, you will probably be doing both spatial and temporal smoothing. There are many theories about whether you should smooth temporally first or spatially... no-one really knows for certain although I prefer to smooth spatialy first. The previous guide had a whole big list of spatial smoothers with different pros and cons and it is true that there are more filters out there to try and remove video noise than anything else. SmartSmoothHiQ - A very good filter that can be hard to configure to get good results. Often better on live action than anime. Worth a try on difficult sources though. _2DCleanYUY2 - Brute force cleaning at the cost of finer details. Generally shouldn't be used on clean sources. Works in YUY2 colourspace only, which is a further downfall. MipSmooth - highly sophisticated but despite the complications of configuration it dose not yield superior results most of the time, unfortunately. msmooth - excellent idea where the edges of the image are masked to stop them from being smoothed. The smoothing itself isn't the best ever, however, and this filter can often leave your source with a slightly yellowish tint if working in YV12. If it wasn't for this colour issue it would be featured heavily in this guide. Otherwise a very excellent filter. If you are doing post processing from an RGB avi file it's worth using in RGB mode as that avoids the colour problems. vaguedenoiser - interesting filter that turns blocky noise into.. noise which is more vague looking. A genuinely nice approach that doesn't hurt details too much but isn't massively strong either. Good if you want to avoid that washed out look that many smoothers can give. It's also the kind of filtering that really helps compression, often moreso than deen - so it's worth looking into for that. Convolution3D- this filter works both spatially and temporally at the same time (hence 3d) and offers very good compressibility increases when used. This has been since superceeded by deen. Deen - 6 filters in one. Can operate in 2d or 3d space with a variety of filtering types. One of the most impressive all-rounders you will find and the filter that we will use for smoothing in this guide. Although I am only going to focus on deen, all of the above filters have something to offer. Post processing is very much dependant on your source and no set of options will work universally. There are many filters I use time and again but I frequently have to tweak settings in order to find the optimum configuration. If you want your video to look good, you should spend this extra amount of time post processing it right. Deen, in terms of output, is actually very similar to msmooth except that it does not suffer from the tint issue. Although its edge detection isn't nearly as customisable, it is naturally very protective of edges - much more so than old school filters like 2D Cleaner. For this reason it can be used for both brute force and more subtle smoothing with good results. Here, "a3d" is the filter type - let me explain what the different filter types are. "c2d" - basic 2d smoothing. "c3d" - convolution 3d... smooths both within the frame and from frame to frame. "a2d" - smoothing optimised for areas of colour like in anime. "a3d" - same as a2d but also smooths from frame to frame. "w2d" - smoothing weighted by distance in order to retain gradients. "w3d" - like w2d but also smooths from frame to frame. The number that comes after the filter type is the area that is to be smoothed. With the "2d" filters this are can go from 1 to 7 (with 7 being a 15x15 area) and when using the 3d filters this value can go as high as 4 (9x9). Here 10 represents the luma threshold, increasing it will increase the amount of smoothing on the luma part of the image. 12 represents the chroma threshold. What you will want to do is try out some of these thresholds until you get a result you like. The defaults are 7 for luma and 9 for chroma. Generally you can smooth chroma more than you can luma without damaging details. The defaults are good for starters but every source is different and you should tweak the settings to find out what is best for your source. Also, be sure to read the documentation on any filters you want to try out. They are all available in the start menu > AMVapp > AVS Filters > Documentation. When you have a pattern like this, it can be a tough call when distinguishing between noise and details. In a sense the noise here is the detail as the texture of the background is very similar to regular mpeg noise (and I'm sure it is made out of a lot of mpeg artefacts too). However, this can be avoided by either reducing the radius of the filter or by reducing the noise detection threshold. Having those things set too high can give you the blurry sponge wash effect you see here. Each source is different so you need to find a happy balance between the getting rid of noise and keeping details. Ideally, what you need to do is find yourself two or three frames of different types - one with lots of detail like this one, another with not so much detail but obvious mpeg noise and maybe a third for good measure (a high motion frame for example). Compare your settings in the different frames. Make a note of the frame numbers and use Ctrl+G to switch from frame to frame. Adjust your options and see which set of options either works well for all the frames or works best for the most common type of frame in your source. If you overblend a source, often what will happen is that instead of having a fine gradient in an area, it will look like it has bands of changing colours instead of one steady progressive change of colour. This can happen a lot around things like light sources in anime. There are several different ways to eliminate this problem. If you are using msmooth then you need to be more careful that your mask isn't selecting areas within the gradients. If you are using deen in one of the "a" modes, then you might want to try one of the "w" modes as this is designed to help against oversmoothing gradients. Temporal smoothing mainly reduces film noise. Whilst this is sometimes the least visible noise in a source it can often be the most destructive in terms of compression as each small fluctuation in noise has to be encoded. Temporal Smoothing works by detecting if a pixel is changing because it needs to change or because there is some noise. If noise is detected then the pixels are either averaged out in time or the first pixel is copied to the subsequent frames. It has various ways of detecting whether it's noise or not, of course, but the result is that it can drastically reduce noise and even more drastically make the video more compressible as it is these subtle changes that we end up compressing. As you may have noticed already, Deen has some 3d options which can be used to do both spatial and temporal smoothing at once. These are the "c3d" "a3d" and "w3d" settings. They are very good at reducing temporal noise and can sometimes be more effective than separate spatial and temporal filters. However, the spatial smoothing in these 3d versions are not always as good as the 2d equivalents. If you find that "a3d" or "w3d" work well for you then you can use this as an all-round spatial and temporal smoother. If, however, you prefer the large ranged smoothing of "a2d" or "w2d" then you may want to use a standalone temporal smoother. For this job there are two filters I recommend: fluxsmooth and temporalcleaner. fluxsmooth - This filter has a spatial component but the spatial component is there to find out what a pixel should be averaged to. This is a very powerful filter and definitely a good addition to almost any filter chain. The default settings are fluxsmooth(7,7) where the first 7 is the temporal threshold and the last 7 is the spatial threshold. Increasing these values can improve the smoothing but this filter needs very little tweaking. temporalcleaner - this is a classic, simple but effective temporal cleaner. This filter is very reliable and can be used at its default settings. Simply add temporalcleaner() to your script. Rainbows are one of the worst kinds of video problems you can find on an anime source. They are caused by bad analogue transfers of video data where the chroma leaks outside sharp fine edges. The result is a mostly yellow but often purple and all sorts of other colours in this rainbowing effect. 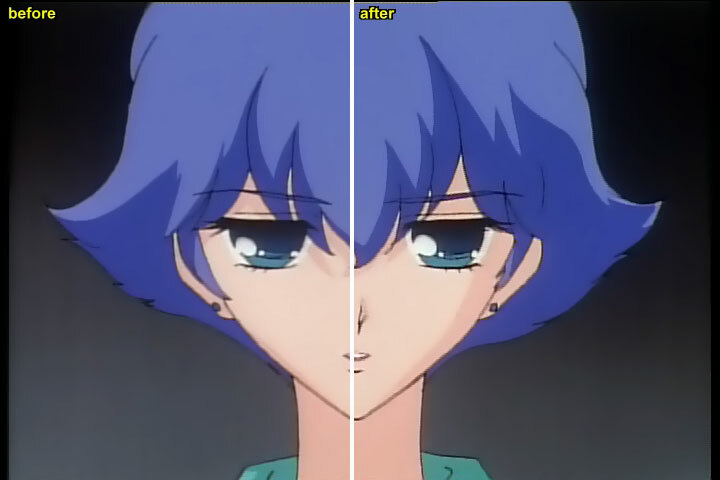 Usually this sort of visual problem is avoided by modern dvd transfer techniques but it is a problem that was prevalent on many bandai dvds (Trigun and Escaflowne being popular examples) and it is still a problem with modern Central Park Media releases. Most of the rainbows have been removed here, but there are some side effects including the pinkness around the girl's mouth. The script used for the rainbow removal is simply mfrainbow(). It is one of several functions that can be used to tackle rainbow artefacts. As the nature of these rainbows can be a little unpredictable it's best to find a frame with lots of them and try these commands out one by one to see what looks best. SDDeRainbow() - A script written by sh0dan on doom9 that I have included in the AMVapp. Bifrost(interlaced=false) - Yatta creators attempt at derainbowing. Bifrost(scenelumathresh=2,altclip=SSIQ(11,300,false),interlaced=false) - a more aggressive and powerful usage of the Bifrost filter. One of the above commands should be able to at least help reduce the rainbows if not remove them altogether. One thing to watch out for, however, is if the filters adversely affect the colour of your image. All of these commands filter the chroma channels so sometimes odd effects may happen so be on the lookout for those if you use these functions. Change the number 1 to 0 for a horizontal split and change the list of filters to whatever you want to process the image. The triple quote marks are there in order to also support filters that contain strings in their arguments like deen("a3d",4). To show a white line across the sections like the image above, use BeforeAfterLine instead of BeforeAfter. Many of you will know that when you compress something, the sharper it is the more detailed it is and the more detailed it is the harder it is to compress. Thanks to this principle, sharpening is often considered the killer of compressibility. Well it is. However, I'm going to forget about that and instead show you how incredible you can get your video to look with some sharpening filters. See, as we are doing all this smoothing which is helping out out compressibility we probably expend a little amount of our bitrate in getting the video looking really sharp. There are a lot of traditional sharpening filters that have been around for a long time and anyone who is a frequent Photoshop user will be familiar with things like Unsharp Mask. Well, we are going to use a few different approaches to sharpening - ones that look only for the edges and sharpen those. Only a gentle sharpening really, but you can see much more clarity on the eyelashes and necklines thanks to this filter. However, this is only the beginning. If you want your video to really stand out with stunning lines then you are going to want to skip msharpen and jump straight to mftoon. That's it. 9 times out of 10 you will not need to change the default parameters of mftoon. However, it can sometimes be a little on the strong side. To lessen the strength use mftoon(strength=128) - the default strength is the maximum of 255 so 128 is half strength. Note that when using mftoon your video processing will grind to a veritable halt as it's a very slow filter. So, if you are going to be encoding the video more than once (likely) then you are better off making a lossless copy of the filtered video and then compressing that. I'll show you how to do that later. Another problem with using sharpening filters as powerful as mftoon is that they will also work on things like your titles, effects and other graphical elements. This is the reason why pre-filtering is better than post filtering as you can apply mftoon before you do your effects or your titles. However, even so it's not all that bad using it on titles and effects. If you have a section of your video that you think is being harmed by mftoon, you can always trim that section out and selectively filter the video. I'll show you how to do that later. 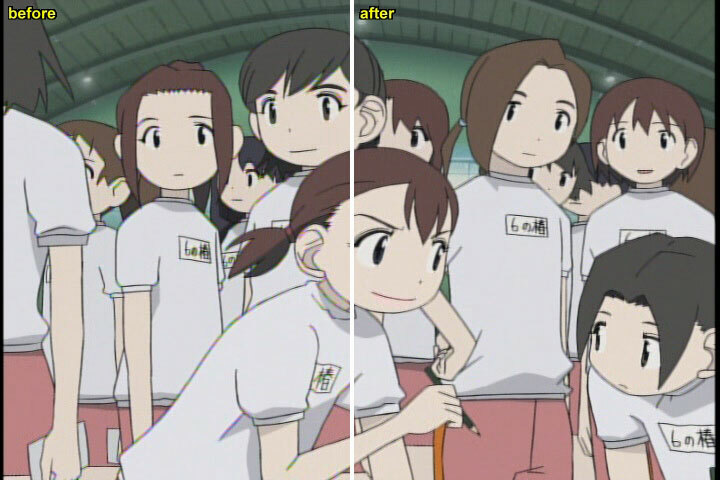 FastLineDarken isn't a sharpener at all, it is simply a filter to darken the lines on your anime. mftoon does this but it also does sharpening and a whole bunch of other stuff which may not to your liking. FastLineDarken simply darkens the lines and is a bajillion times faster than mftoon. It's a wonderfully simple tool that I cannot recommend highly enough. Finally, the last of the sharpeners I would like to mention is SSXSharpen. This is a sharpening function that uses supersampling - i.e. it scaled the image up before processing. It's a wonderful sharpener and if you are feeling really daring with your sharpening then you can run this after mftoon to improve the image even more. The default command SSXSharpen() is fine but you can add a number in the brackets to specify the scale of the supersampling using ssw and ssh (for width and height respectively). The default values are 4, so you can lower this to two or even increase it to something silly like 8. You can also change the strength and threshold of the sharpening by defining xstren and xthresh. Now, one might be forgiven for looking at that mftooned image and thinking "the colours look pretty good to me". Well... they're almost right, but not quite. 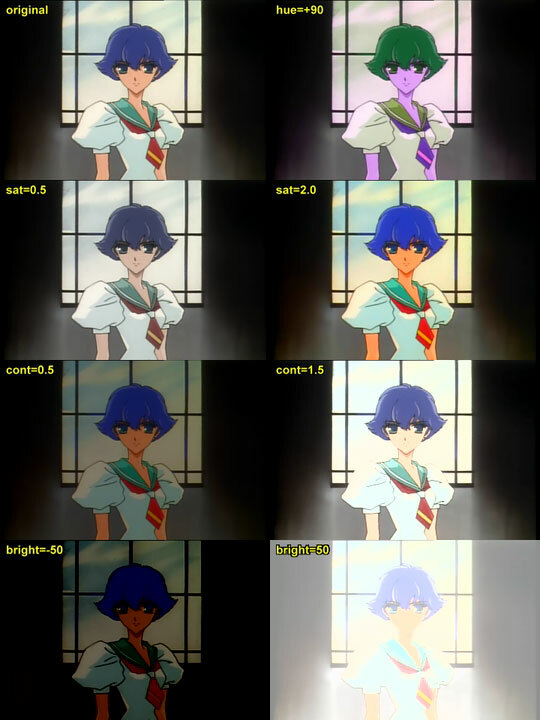 Many anime sources have colour and brightness settings that people just plain take for granted. The reality is often that, on a monitor at least, they are often undersaturated, dull and low contrast. Luckily for us, there is a great avisynth filter to change these things for us called Tweak. The settings here will not change the image at all, they are the settings where everything stays the same. Cont means contrast and 1.0 means it is at the regular setting. Change that to 2.0 and the contrast is doubled. Likewise sat means saturation (colourness) and the same scale applies. Reduce this to zero and you will get a greyscale image. Bright means brightness. This value alters the value of each luma channels up or down. This can go to plus or minus 255 with +255 being pure white and -255 being pure black. Hue cycles the colour values on the chroma channel. This can be + or - 180 but is not the kind of effect we generally want to use to improve our image as it is unlikely that the colours will be offset by a universal value that can be fixed by cycling the hue. The effects of each of the settings are all pretty much what we'd expect. Of course, I've set really extreme values here so you can see what effect each option has. The saturation has made all the colours louder or more washed out, the contrast either increases the difference between the light and the dark or reduces it and finally the brightness either adds or subtracts from the luma value of each pixel. Self explanatory mostly, however there is one ulterior motive in showing these images and that is to note something which is wrong with the source. The saturation at 2.0 has doubled all the chroma values and we can see that this has made all the colours vibrant... including the clouds and the uniform. Now, forgive me if I'm wrong but aren't both of these things supposed to be white? There's the rub. When I said earlier that you'd probably think that the utena image was fine in terms of colour and I said it's not quite correct, this is what I meant. 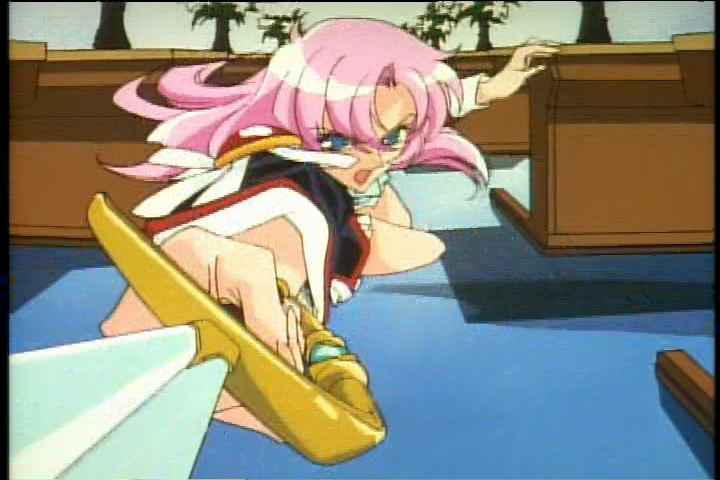 The utena footage (on this dvd at least) seems to have a very slight yellow tint on everything and this is noticeable on things that are supposed to be white. Now, those of you who can remember the talk about colourspaces and chroma may recall that chroma channels can have a positive or a negative value. Positive V is red and negative V is green... and likewise positive U is blue and negative U is yellow. This footage has slightly incorrect U chroma. To fix this, we can use a function called ColorYUV. This has a lot of settings and is generally for advanced users only but it is useful to show you the difference simple colour changes like this can make to a source. See, even Miki was surprised by the difference. One of the things about colour correction is that you often take an image for granted. You get used to it and you don't question it. It usually takes a really big difference like the red tint in the Japanese release of Spirited Away for people to notice. However, a small change like this can really make your footage stand out. These whites are good enough to be in a Tide commercial. I'm not expecting all sources to have this particular problem, though. Most sources simply have saturation and contrast levels that are lowered for TV outputs so you will want to tweak these. So you've seen smoothing, rainbow removal, extreme sharpening and colour correction. By using all of these things together you will see a HUGE difference between the source you had at the start and the one you have now. Looks It's not a bad correction, given the dreadful original frame but this heavy filtering may not be good on the anime as a whole, so you need to find a balance. You can see how some of the other scenes turned out on this page. By now you should have a pretty nice looking video... you just need to crop and resize.